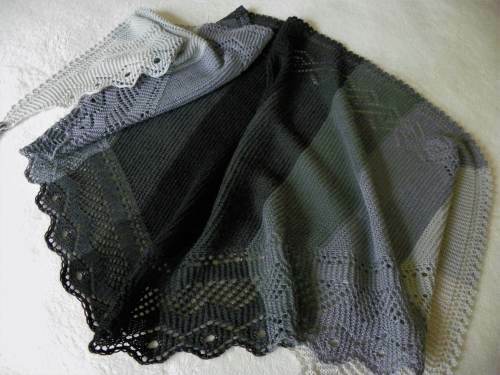 Yell Sound Shawl employs traditional Shetland Island lace garter stitches, tapering to tasseled ends. Main body, where most of the shaping takes place ( Make 1, K2tog), is a simple garter stitch. Nice aspect to this style knitting, both sides look great. Change up the color to personalize, gradate your color choices differently or try a colorway yarn. The pattern is chart only. 1100 yds. Sport weight yarn, #5 needles and stitch markers are all the materials needed.